One of the gorgeous beauties of all times, Anita Hassanandani, who is currently seen playing pivotal roles of Shagun and Vishaka in Ekta Kapoor's much-celebrated shows Yeh Hai Mohabbatein and Naagin 3, turns a year older today (April 14) and birthday wishes have been pouring in for the actress from her fans on social media. The stylish television star, who has gained a lot of popularity with her exceptional acting skills in YHM and Naagin 3, ringed in her 38th birthday with husband Rohit Reddy and her industry friends in a grand bash. Anita Hassanandani and Rohit Reddy Enjoy a Blissful Vacation in Goa; Their Pictures Will Make You Want to Pack Your Bags Right Now! A host of her friends turned up to wish the actress on her special day and if the pictures and videos floating on the Internet are anything to go by, the group had a helluva time. 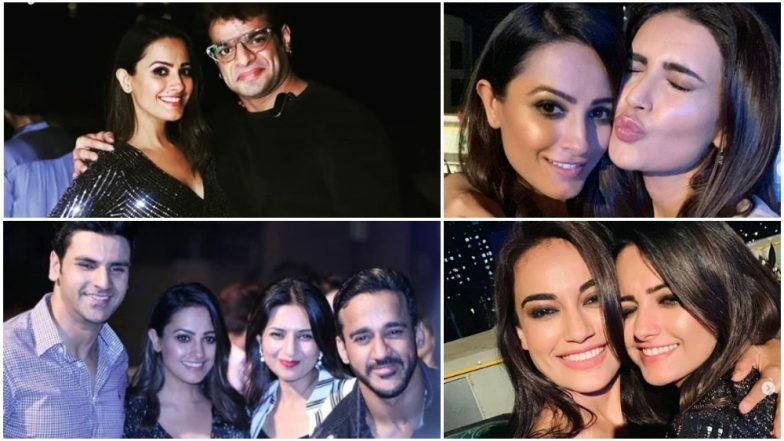 Several popular TV stars including Divyanka Tripathi, Pearl V Puri, Surbhi Jyoti, Arjun Bijlani, Karishma Tanna, Karan Patel, Vivek Dahiya, Vikas Gupta, Drashti Dhami and Niraj Khemka, Nia Sharma among others attended Anita's birthday bash and made her day even more special. On the personal front, Anita and Rohit tied the knot on October 14, 2013 and today their completing 5 whole years. Recently, Anita grabbed headlines when one of her social media posts gave rise to speculations that she is soon going to deliver twins. On the professional front, Anita has three shows in her kitty including Yeh Hai Mohabbatein, Naagin 3 and Comedy Circus. Watch this space for new updates. While Naagin 3 is one of the top-rated shows on TV, Yeh Hai Mohabbatein too is fetching decent TRPs.